Italy offers many beautiful beaches up and down the boot. One can’t help to think of some of them when hearing the name Amalfi, Sorrento, Sardinia or Portofino for instance. 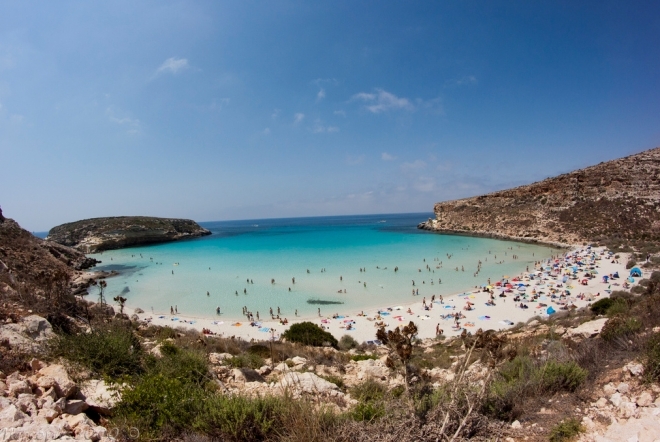 However, when recent names of top beaches around the world were compiled…one not so common destination, Rabbit Beach in Lampedusa, Italy made the list as a favorite among reviews and ratings by international tourists. A remote beach off the south coast of Sicily – Rabbit Beach, on the island of Lampedusa, is an unspoiled nature reserve that can only be accessed by boat and one of the few places in the Mediterranean where loggerhead sea turtles go to lay their eggs. Located about halfway between Malta and the shores of North Africa, Lampedusa is graced with white sand beaches, crystal clear turquoise water, and stunning bluffs without much of exploitation in the name of tourism, and remains one of the most well preserved beaches of Italy. Charming villas and hotels in styles from Mediterranean to Caribbean and African offer a nice variety. During the hottest nights of the summer, make an effort to attend the many celebrations happening on the island’s beaches, including bonfires, spaghetti cookouts and barbecues, and musical performances. Today Lampedusa is an ideal place to spend a holiday away from regular bathing resorts. The island is busiest in August, but in other months of the year the island reverts to a lonely and quiet place, a very suitable moment to explore the island in all its aspects. New Year’s Good Luck Rites? Look Ahead to an Italian Summer!